(Click image to enlarge). According to a study by the Women Donors Network, 95% of elected prosecutors in the U.S. are white and 79% are white men. An analysis by DPIC of the study's data further shows that, in states that have the death penalty, 94.5% of elected prosecutors are white. 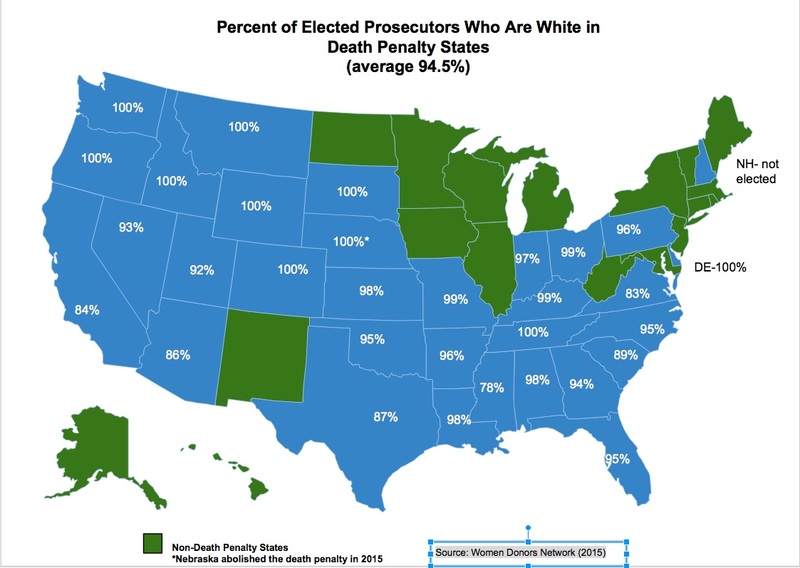 In 9 death penalty states (Colorado, Delaware, Idaho, Montana, Oregon, South Dakota, Tennessee, Washington, and Wyoming), 100% of elected prosecutors are white. (N. Fandos, "A Study Documents the Paucity of Black Elected Prosecutors: Zero in Most States," The New York Times, July 7, 2015). According to a recently updated study by Professor Katherine Beckett of the University of Washington, jurors in Washington "were four and one half times more likely to impose a sentence of death when the defendant was black than  they were in cases involving similarly situated white defendants." The earlier version of the study had found that juries were three times more likely to recommend a death sentence for a black defendant than for a white defendant in a similar case. The disparity in sentencing occurred despite the fact that prosecutors were slightly more likely to seek the death penalty against white defendants. The study examined 285 cases in which defendants were convicted of aggravated murder. The cases were analyzed for factors that might influence sentencing, including the number of victims, the prior criminal record of the defendant, and the number of aggravating factors alleged by the prosecutor. THE ROLE OF RACE IN WASHINGTON STATE CAPITAL SENTENCING, 1981-2014 (Originally published Jan. 27, 2014, updated with additional data 2015). The original version of the study, covering only 1981-2012, is available here. DPIC Summary of North Carolina v. Robinson, the first ruling issued under North Carolina's Racial Justice Act (April 22, 2012). UPDATE: In 2013, the Racial Justice Act was repealed. In 2015, the state Supreme Court vacated the ruling in North Carolina v. Robinson, holding that the state should have been given more time to review and respond to studies showing racial bias in jury selection. Even though blacks and whites are murder victims in nearly equal numbers of crimes, 80% of people executed since the death penalty was reinstated have been executed for murders involving white victims. More than 20% of black defendants who have been executed were convicted by all-white juries. The report also examines case law and international policies related to race and the death penalty. Maryland Study Finds that Race and Geography Play Key Roles in Death Penalty - According to the findings of a Governor-commissioned death penalty study conducted by researchers at the University of Maryland, the state's death penalty system is tainted with racial bias, and geography plays a significant role in who faces a capital conviction. The study, one of the nation's most comprehensive official reviews on race and the death penalty, concluded that defendants are much more likely to be sentenced to death if they have killed a white person. See DPIC's Press Release. For more information about the study, see the Executive Summary and Complete Study (Released on January 7, 2003). 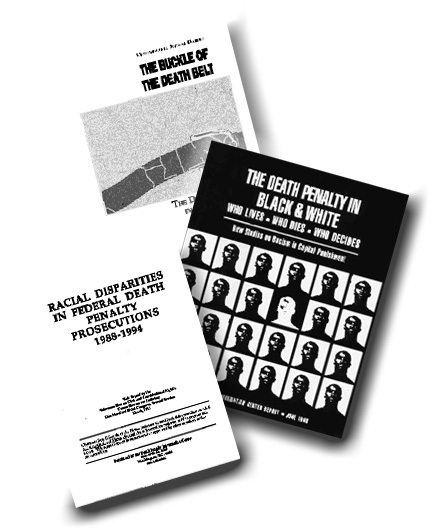 "Race and the Death Penalty in North Carolina An Empirical Analysis: 1993-1997" This study, the most comprehensive ever conducted on the death penalty in North Carolina, was released by researchers from the University of North Carolina. The study, based on data collected from court records of 502 murder cases from 1993 to 1997, found that race plays a significant role in who gets the death penalty. Prof. Jack Boger and Dr. Isaac Unah of the University of North Carolina found that defendants whose victims are white are 3.5 times more likely to be sentenced to death than those with non-white victims. "The odds are supposed to be zero that race plays a role," said Dr. Unah. "No matter how the data was analyzed, the race of the victim always emerged as an important factor in who received the death penalty." The study's findings will be presented to the North Carolina General Assembly which is currently considering moratorium bills in both the House and Senate. (Associated Press, 4/16/01 and Common Sense Foundation Press Release, 4/16/01) Read DPIC's Press Advisory. the U.S. Court of Appeals for the Fourth Circuit has granted relief in only one of 131 capital cases between 1978-1997. The report is available from the ACLU of Virginia by calling (804) 644-8080. The Federal Death Penalty System: A Statistical Survey (1988-2000) A review of the federal death penalty by the Justice Department, released on September 12, 2000, found numerous racial and geographic disparities. The report revealed that 80% of the cases submitted by federal prosecutors for death penalty review in the past five years have involved racial minorities as defendants. In more than half of those cases, the defendant was African-American. Attorney General Janet Reno said she was "sorely troubled" by the results of the report and has ordered United States attorneys to help explain the racial and ethnic disparities. The report also found that 40% of the 682 cases sent to the Justice Department for approval to seek the death penalty were filed by only five jurisdictions. "I can't help but be both personally and professionally disturbed by the numbers that we discuss today," said Deputy Attorney General Eric Holder. "[N]o one reading this report can help but be disturbed, troubled, by this disparity." Reno is expected to announce more studies of the administration of the federal death penalty. (New York Times, 9/12-13/00) See also, DPIC's summary of the report findings. 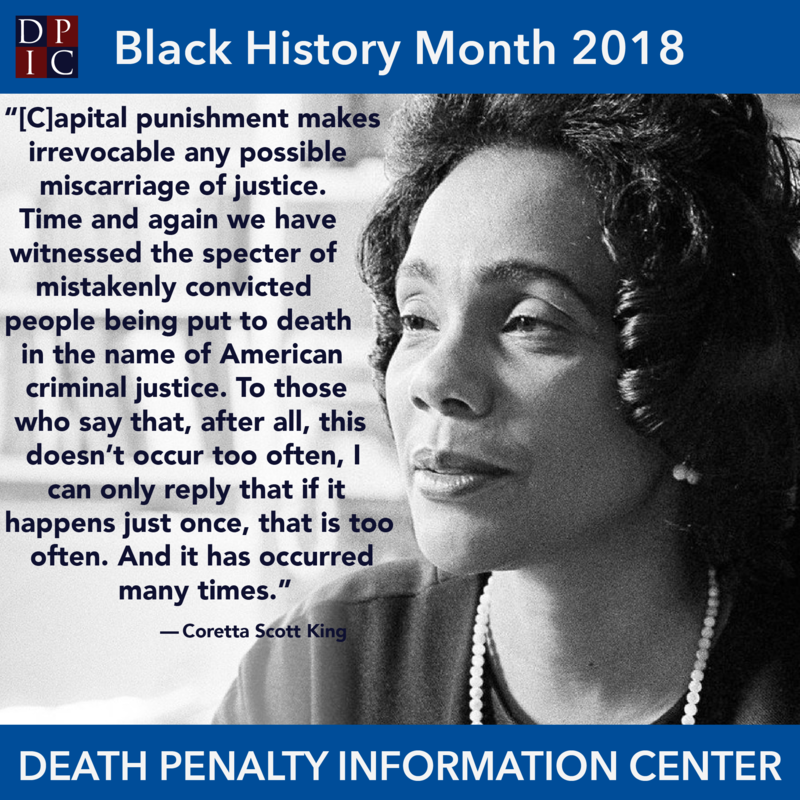 Each weekday during February 2018, DPIC posted a new infographic on race and the death penalty on ourFacebook and Twitterpages. Click here to view the 2017 Black History Monthy Infographic Series. Racial bias has always been a significant issue in death penalty debates. There have been many careful statistical studies indicating that race plays a significant role in determining who lives and who dies. For example, a study released in 2003 by the University of Maryland concluded that race, along with geography, is an important factor in death penalty decisions in that state. Prosecutors are more likely to seek the death penalty when the race of the victim is white and less likely when the race of the victim is African-American. Nearly 80% of death row defendants who have been executed were sentenced to death for killing white victims, even though in society as a whole about half of all murder victims are African American. Marcus Robinson was the first defendant to receive a hearing under the RJA. During that hearing, he presented evidence of a long history of racial bias by North Carolina prosecutors in capital case jury selection, at the state and county levels and in his particular case. On April 22, 2012, North Carolina Superior Court Judge Greg Weeks credited Robinson's evidence, holding that “race was a materially, practically and statistically significant factor in the decision to exercise peremptory challenges during jury selection by prosecutors” at the time of Robinson’s trial. Judge Weeks overturned Robinson's death sentence and re-sentenced him to life without possibility of parole. The prosecution appealed and the legislature amended the RJA to make it more difficult to win relief in future cases. 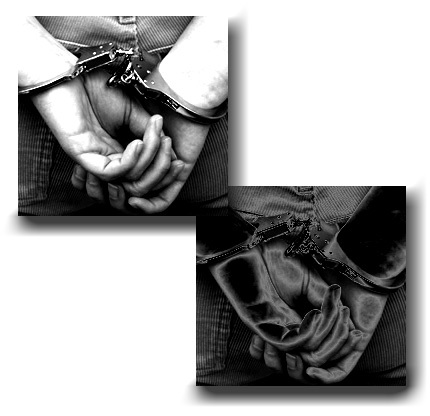 On December 13, 2012, after a consolidated evidentiary hearing for three other death row prisoners conducted under the amended RJA statute, Judge Weeks found that “a wealth of evidence" had demonstrated that North Carolina prosecutors had engaged in a decades-long practice of intentional race discrimination in jury selection in capital cases. As a result of "the persistent, pervasive, and distorting role of race in jury selection throughout North Carolina," he vacated the death sentences imposed upon Quintel Augustine, Christina Walters, and Tilmon Golphin and resentenced them to life without parole. Again, prosecutors appealed the ruling. The North Carolina state legislature responded on June 5, 2013, by repealing the Racial Justice Act. The state's new Governor, Pat McCrory, signed the repeal bill. On December 18, 2015, the North Carolina Supreme Court reversed Judge Weeks' rulings on procedural grounds. The Court said that "fundamental fairness" required that prosecutors be afforded more time to "to prepare for this unusual and complex proceeding." The court remanded the proceedings to the trial court and invited both sides to present additional statistical evidence at a new hearing. A new hearing has been scheduled, to be presided over by Judge Jim Ammons, whom defense lawyers have sought to recuse from the case on grounds of bias, including that as the prosecutor in a capital murder trial in 1988, he disproportionately exercised discretionary jury strikes to exclude qualified black prospective jurors at 3.3 times the rate that he struck all other qualified potential jurors. View a video describing how race played a significant role in the case of one man who was recently executed in Georgia. For more information, see DPIC's Page on Race. For a downloadable podcast about race, click here.